This year’s 2013 ‘Be a Changi Millionaire’ Grand Draw (for promotion period 12 May 2012 to 11 Nov 2012) was an exciting one with some interesting “plot” twists. The 5 Changi Millionaire finalists got a headstart in their luck when the 6th finalist – Mr Chen Ziwu was unable to attend due to personal reasons and was thus disqualified of the chance to be a Changi Millionaire. Check out the video below for a summary of the entire 2012 ‘Be a Changi Millionaire’ Grand Draw this afternoon. For more of such videos, check out PassportChop Singapore Travel Blog Youtube Video Channel. Read on for the interesting rounds that the Changi Millionaire finalists had to go through to vie for the million dollars. Our Changi Millionaire finalist – Ms Pan Lizhu Rebecca started off the Changi Millionaire Grand Draw smoothly, finishing number one in the first round of “Dress Up the Mannequin”. This is a non-elimination round where the finalists will continue to the next round in the order by which they finish dressing up their respective mannequins. The second round is an elimination round where the finalists will have to pick top hats from the 10 dancers wearing them. 1 of the 5 finalists will be eliminated if the top hat they chose did not contain the star symbol. Ms Pan’s luck continued to the second round where on her first pick of the dancer’s top hat, she got one with the star and she proceeded to the third round. 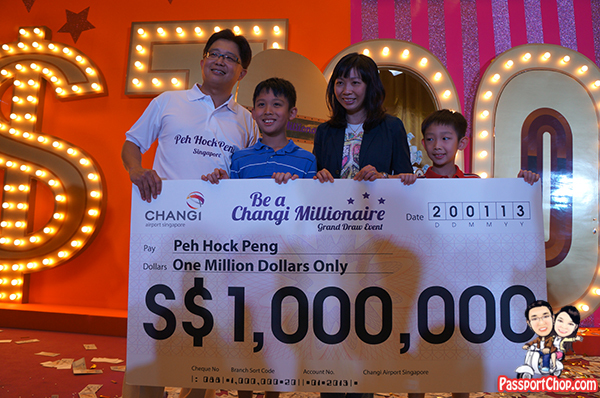 The Changi Millionaire organisers decided to let all 5 finalists through to the next round. The third round is an elimination round where the finalists will have to pick life-sized Jenga-Gold Bar blocks. Only 2 of the 5 finalists will make it through to the final round to vie for the 1 Million Singapore Dollar Prize if their selected Jenga-Gold Bar block contains the star symbol. After Sun Ming picked a block with the star and proceeded to the final round, the Changi Millionaire organisers decided to introduce a last-minute sudden death round involving the 4 remaining Changi Millionaire finalists. The 4 remaining finalists have to pick a ball from a box and the finalist who picked the ball numbered 1 will move up to the final round to vie for the million dollars with Sun Ming. Ms Pan’s luck unfortunately ran out here as she picked a ball numbered 3 and was eliminated from the million dollar draw. Ms Mara Cusick was eliminated next. Mr Peh Hock Peng was next and he picked the ball numbered 1 and moved on to the next round! The final round is between Ms Sun Ming and Mr Peh Hock Peng – read on to find out more about what they bought to become a Changi Millionaire. Ms Sun Ming (孙明) from China had just completed her postgraduate studies at international graduate business school INSEAD in Singapore, and was on her journey back home to Shanghai in late June, when she shopped at Changi Airport. Before boarding her China Eastern Airlines flight on 24 June, Ms Sun bought S$280 worth of Estée Lauder and L’Occitane beauty products at the Perfumes and Cosmetics store at Terminal 3. Mr Peh Hock Peng from Singapore is a business development director of an intellectual property firm, shopped at Changi Airport in August 2012 before departing for a business trip. Before boarding his Singapore Airlines flight to Chennai, India on 13 August, Mr Peh visited the Perfumes and Cosmetics store at Terminal 2’s Departure Transit Mall, where he bought S$210 worth of cosmetics for his wife. The mechanics of this final round is simple – spin a wheel to get your key and if the key opens up the door to a million dollars, you win! No drama here – Ms Sun Ming’s first try at opening one of the door resulted in a “Try Again” message and Mr Peh’s first try at the door won him the Million Dollars – crowning him as the 2012 Changi Millionaire!